Welcome to The Abso!ute Sound online! We explore music and the reproduction of music in the home. We believe that the sound of music, unamplified, occurring in a real space is a philosophic absolute against which we may judge the performance of devices designed to reproduce music. Our goal is to provide the resources consumers need to judge how a component's sound either honors or departs from the music's truth, and to make sound purchasing decisions that maximize their experience of reproduced sound. Below is our Issue 136, June/July 2002 table of contents and editorial. Classical snobbery redux, jazz reviews in TAS, Accuphase controversy, and the readers respond to TAS' new cover and graphic design. A peek at new products from Wilson Audio, Classé, VTL, Dynaudio, Accuphase, and Rotel. Paul Seydor samples some tasty new vinyl offerings from Groove Note, Analog Productions, and Pure Audiophile, and reports on the resurrection of Mobile Fidelity Sound Lab. In the first installment of this new column on affordable high-end equipment, Wayne Garcia wades into multichannel with Magnepan's new MGMC1 and MGCC2 loudspeakers. J. Gordon Holt explores the idea of imaging in multichannel audio systems. In this first installment of a new feature, we recommend 26 power amplifiers, 12 integrated amplifiers, and eight multichannel amplifiers from $895 to $40,000. Eight reviewers recommend ten complete music systems from $2,800 to $300,000. HP auditions the Gamut CD-1 CD player, and continues his exploration of the Magnepan MG 20.1. 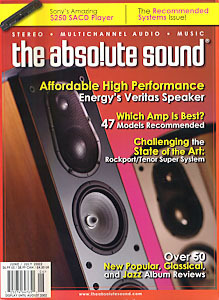 Veritas—Truth—should be the goal of every high-end loudspeaker. John Higgins explains why this new loudspeaker from Canada's Energy is appropriately named. The $2,199 Arcam "Full Metal Jacket" 23 CD player may be the best bargain in high-end audio, according to Fred Kaplan. Want to know what all the SACD fuss is about? Sony's $250 multichannel SACD player lets you sample the format for practically nothing. Shane Buettner reports. Wayne Garcia puts three British integrated amplifiers head-to-head—with some surprising results. Our resident small-speaker expert Neil Gader evaluates this subwoofer/satellite package from Athena Technologies.. This system, which stunned everyone who heard it at CES, may be the best audio system in world, according to Jonathan Valin. Greg Petan reports on this high-current powerhouse from one of high-end's most innovative designers, Nelson Pass. Although among the most expensive interconnects and cables in the world, MIT's Oracle sets a new standard in performance. Greg Petan reports. With good SACD performance, surprising CD sound, and DVD-Video to boot, Sony's new $300 machine is an ideal all-around performer, according to Chris Martens. Brutally Cruel: Elvis Costello Is This Year's Model. Bob Gendron evaluates When I Was Cruel, Elvis Costello's brand-new recording, explores Rhino Records' recent second wave of Costello catalog reissues (This Years Model, Blood and Chocolate, Brutal Youth), and says why all four titles are indispensable. Neil Young: Are You Passionate? Atomic Basie! Gary Giddins weighs in on Classic Records' 180-gram vinyl treatment of Count Basie's 1957 sessions.